Location: /Strings/Banjo strings/5 String Classical Banjo/CLASSICAL/CLAWHAMMER BANJO PURE GUT TIE-ON. FOR THE CONNOISSEUR. Many banjoists much preferred the unique tone given by gut strings. The problem was that untreated gut is very susceptible to moisture and soon begins to fray. Using the very latest in modern technology this has been cured, our strings are treated with a hard-wearing moisture repellent which in no way affects the tone. Apart from the silver plated 4th, these strings are all pure gut and generate a truly wonderful tone. Before fitting your strings please ensure the nut and bridge are free from sharp edges. The nut grooves should not be too deep and they should be perfectly smooth. Our gut strings will repel the moisture in your fingers. Many years of research have gone into these hand made strings and we firmly believe they are the best money can buy. The 1st, 2nd, 3rd and 5th strings are all moisture resistant pure gut. We experimented with a silver wound on gut string for the 4th but the cost was ridiculous, one string would cost more than the entire set. So we went back to the drawing board and came up with a 4th string which gives a brilliant tone and lasts for a considerable amount of time. If you take your banjo playing seriously and seek the best possible tone, then these are the strings for you. These strings are 3' 3" (1 meter) long, they are not suitable for long neck banjos or for banjos with an extended peghead. Please check that they will fit your instrument, before ordering. 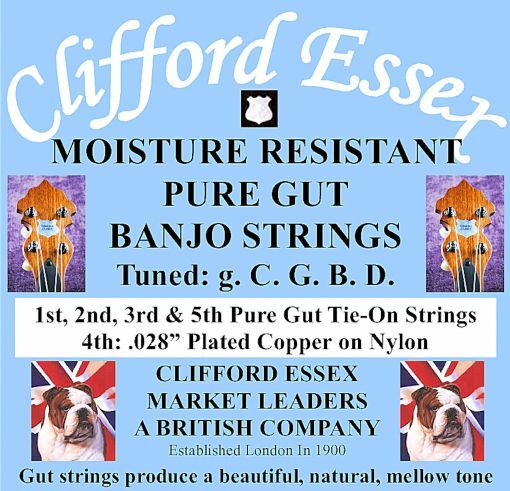 PURE GUT, MOISTURE RESISTANT, BANJO STRINGS. Best strings tried to date. Clean, powerful sound with great attack and nice feel under the fingers. Strings 3 Sets: 10% Discount. (+£21.25) No Thanks.